It was mid-November 1898. The wind whipped down Cincinnati’s main business street as though its mission were to cause chaos and havoc. As with most main streets of a bustling downtown, just over a century after the city was founded, the streets of Cincinnati came alive with the rising of the sun. Thanksgiving was fast approaching and many were beginning to prepare for the coming holiday season. But the conversation that took place during this early morning, on November 17th, between Covington, Kentucky native B.F. Howard and Arthur Riggs, was as brisk and stern as the wind that cut through the air. For on that particular morning, the first Black Elks lodge assembled at the Masonic Hall on George Street in downtown Cincinnati. Both men were originally from Kentucky: Howard from Covington and Riggs from Shelbyville, but it wasn’t until the two were working together at downtown Cincinnati's Grand Hotel, then located on the southwest corner of West Fourth Street and Central Avenue, that they set out to found their own fraternal organization. Incidentally, long since demolished, the former site of the Grand Hotel is now occupied by onramps to I-75. Howard and Riggs decided there was a need for a fraternal organization that specifically served the needs of African-Americans, and thought the Benevolent and Protective Order of Elks (Elks), an American fraternal order founded in 1868, was a suitable model. After being denied membership to the Elks because they were African-American, the duo tried to obtain a copy of the Elks’ ritual for themselves. At the time, working as a train porter, Riggs struck luck and obtained a copy of the ritual from a member of the Elks who was traveling aboard a train he manned. Riggs then shared the documents with Howard. But before moving forward, the two sought legal advice from an attorney concerning the ritual and found that, after reviewing the Register of Copyrights of the Library of Congress in Washington, D.C., no Elks ritual had received a copyright. At that point, Howard and Riggs took it upon themselves to copyright the ritual as being the proprietor, and not the author. Despite their due diligence to ensure that they were well within the law, even to go as far as rearranging sections of the ritual, everything for the newly formed Black Elks, then named the Improved Benevolent and Protective Order of Elks, was not completely in the clear and out of trouble. After word spread throughout the country that an unauthorized sect of Elks led by African-Americans was formed and operating in Cincinnati, the Elks made it a point to shut down the group. They even threatened to lynch the founders of the Black Elks. Not able to handle the pressure and threats brought on by the Elks organization, in 1899 Riggs left the Greater Cincinnati area and took on an assumed name in Springfield, Ohio. 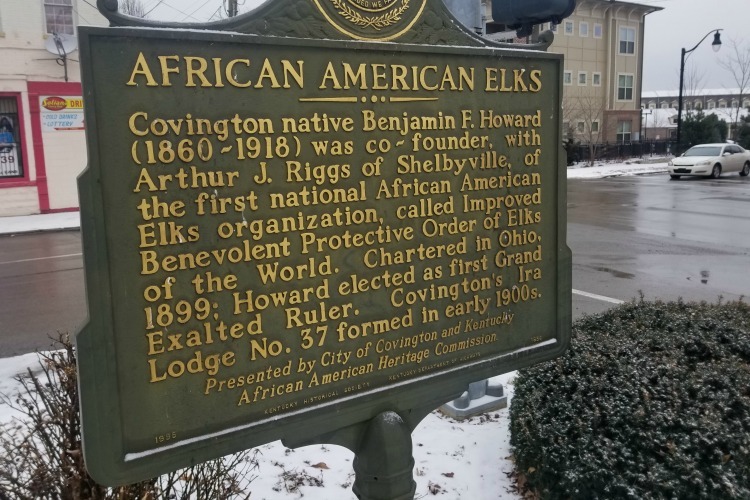 But before Riggs relocated, he entrusted his newly trademarked ritual — all the papers and printed material pertaining to the Elks to B.F. Howard — and Covington Kentucky became the new headquarters for the Black Elks. Going back to their first meeting, when Howard and Riggs addressed their new members, introducing the organization’s purpose with the following message and wish that “the welfare and happiness of it’s members be promoted and enhanced,” many may have thought that this was simply another attempt that Riggs was making to be the leader of yet another African-American fraternal organization. Just a few years prior, in 1896, Riggs helped organize the Knights of Pythias Lodge and served as its Grand Chancellor. During the late 1800s in the Greater Cincinnati area, there were already a number of African-Americans who belonged to established organizations such as Odd Fellows, Masons, Grand Army of the Republic, as well as the Knights of Pythias. But the only truly radical item which set the Black Elks apart from the Elks was that it had the designation of being “improved,” a proposition put forth by Howard and Riggs, both born and raised in a very post-antebellum society. What the two Kentuckians wanted to see was the ideal of an African-American community fully vested in the new, emerging society at large, proud of the American dream. And the Black Elks organization, now headquartered in Covington, Kentucky, was well on its way to being the face of that ideal. It was noted in area newspapers at the time that Northern Kentucky African-Americans were beginning to show a collective strength through fraternal groups such as the Black Elks. The Kentucky Post went as far as to say that B.F. Howard was “the Black Ingersoll,” referencing Robert Green Ingersoll, a nationally known lecturer in the late 1800s on scientific and humanistic subjects. It was one of the reasons Eugene Rice, current member of the Black Elks, joined. Rice is a longtime resident of Covington and a member of St. James AME Church in Covington — the same church that Howard attended. Despite its rocky start, according to its website, the Black Elks currently has 500,000 members in more than 1,500 lodges worldwide, making the Black Elks the largest Black fraternal organization in the world. But Covington has not forgotten about its native son. A state historical marker stands in a median that splits 11th Street between Greenup and Scott streets in Covington. The marker was the 26th approved by the Kentucky Historical Society to honor people and events in Covington. Howard died in 1918 and is buried in Historic Linden Grove Cemetery in Covington. Read more articles by Kareem A. Simpson. Raised in the inner city of Covington, Kentucky, Kareem Simpson is an author, innovator, community enthusiast, military veteran, serial entrepreneur, foodie and lover of all things creative.